A £1.5bn plan to overhaul a traffic-choked area of south London has won the backing of the council. 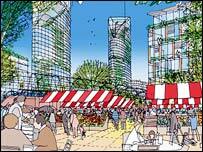 The "masterplan" for regenerating a 170-acre site of Elephant and Castle was adopted by the London Borough of Southwark on Thursday evening. It means it can start looking for developers to create a new town centre. Elephant and Castle's red shopping centre and five 12-storey blocks of flats are to be demolished and the gyratory road system will be re-routed. The area has good transport links, is close to the City and the West End and is within walking distance of 11 Thames river crossings. But the council feels its development has been stifled by its post-war layout, with its six-lane roundabout, high-rise flats and a shopping centre which has been nominated as London's ugliest building. Under the scheme there would be 4,200 new and replacement homes, four new open spaces, a new civic square and a market square using "forgotten" Victorian railway arches. The plans went out to a three-month public consultation last year and the council says 80% of respondents supported the plans. In a separate survey of the residents of the post-war council blocks on the Heygate Estate, who are to be re-housed, 61% of respondents supported the plans, 12% opposed them and 28% had no opinion about them. Councillor Catherine Bowman said: "Our plans for a new town centre will give the Elephant back its heart and create a place where people will want to travel to, not just through." Construction is expected to start on some of the new housing sites by the end of 2004, but the entire project will take about 10 years to complete. "You don't come here unless you live or work here, it's a place you travel through."